Greece Soccer Team - EURO 2004 Champions - Konstantinos Katsouranis - by La Cancha-News On World Cup 2006 - "World's Leading Soccer Magazine!" A player blessed with attacking instincts and splendid close control, Konstantinos Katsouranis was considered one of the most talented players in Greece when he appeared at the UEFA Under-21 European Championship finals in Switzerland in May 2002. Katsouranis was called up by Greece for the UEFA EURO 2004 qualifiers against Spain and Ukraine, yet did not play in the historic victories. After 25 games for the Under-21 team, he finally made his senior bow against Sweden on 20 August 2003. Katsouranis burst into Panahaiki GC's senior side at the age of 17 and scored on his debut against FC PAOK Thessaloniki in the 1996/97 season. Although he played only four matches the following season, Katsouranis then enjoyed four superb campaigns at the Patron stadium. 2002: At the conclusion of the 2001/02 campaign and his contract, the defensive midfield player was sought by all three major teams from the Greek capital and it was the move to AS Monaco FC of Akis Zikos that appeared to prompt his decision to sign for AEK Athens FC two months later on a four-year deal. He enjoyed his best season in front of goal domestically, scoring six in 26 games, and also impressed in the UEFA Champions League, sparking a comeback against Real Madrid CF. 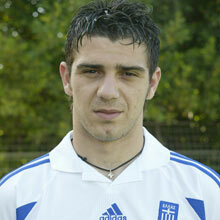 2003/04: Was more at ease in his second season at AEK, proving an ideal foil for Thedoros Zagorakis. Katsouranis had more freedom to attack, scoring seven goals, three of them headers, in his 27 matches. With a splendid long-range shot, Katsouranis scored the winning goal for AEK at Olympiakos CFP in what was the champions only home defeat of 2002/03.